For 41 years, from 1938 to 1978, the Schwinn Bicycle Company of Chicago offered a unique but little-known line of specially constructed lightweight bicycles: The fillet-brazed chrome-molybdenum models, which were tucked into Schwinn's model lineup between the lugged Paramount and flash-welded models like the Varsity and Continental. Schwinn's fillet-brazed CrMo models were beautiful and sweet handling, but in the 1970's bicycle-boom they lost ground to more popular lugged-frame construction, and never recovered. The story of these unique bicycles is a meaningful branch of Schwinn's history. They are worth recalling as a unique Schwinn production strategy and a sidebar in the evolution of the bicycle industry. Until the recent rise of quality TIG-welded and composite bicycle frames, most high quality lightweight bicycles used lugs (external metal sleeve fittings) to join their frame tubing. Fillet-brazing is an alternative method of constructing high-quality lightweight bicycle frames without the use of lugs. Fillet-brazed bicycle frames are strong and have a neat and clean appearance, but they are uncommon because of the additional craftsmanship required. Lugged bicycle frames, for example, are now manufactured by automated machines. Custom framebuilders still provide fillet-brazed construction, and tandem framesets were often fillet-brazed when lugs to fit their frame angles were not available. Arnold, Schwinn & Company was incorporated in Chicago in 1895, during the boom in bicycle sales of the 1890's. At that time bicycles were a fashionable but expensive mode of transportation for adults. Arnold, Schwinn & Co. originally produced standard light adult models weighing 19 to 24 pounds, and priced from $100 to $150, a lot of money in those days. In time bicycles became less expensive, but by the end of World War I automobiles had taken their place as the popular form of transportation. Bicycles began to serve more as vehicles for children, which led to the development of heavier and sturdier models. From the 1920's until 1938 Arnold, Schwinn & Co. became primarily a producer of heavy-duty juvenile bicycles. The top-line Paramount series , with framesets built of silver-soldered Reynolds 531double-butted tubing and Nervex lugs. brass fillet-brazed of SAE 4130 chrome molybdenum straight-gauge seamless tubing. flash-welded ("electro-forged") 15-16 gauge longitudinally-welded steel tubing produced in Schwinn's own tube mill. The fillet-brazed CrMo frame construction of Schwinn's second class of lightweight bicycles - the Superior, Sports Tourer and Super Sport - was unique. The production flow for these bicycles began with frame fabrication in the handbuild part of the Chicago Schwinn factory; a low-volume production area. Frame tubes were mitered in a jig by machine, and then the remaining fabrication work (brazing, filleting, braze-ons, and finishing) was done by hand. The seat and down tubes, as well as the top tube on the largest frame sizes, are slightly oversize at 29.5 mm in diameter. Schwinn called this tubing "1 1/8 inch diameter." For additional strength the frame tubes and stays are reinforced with internal sleeves at the brazed joints; a sort of "butting." Schwinn's goal in building these framesets was to achieve greater strength at the expense of a little more weight. Customers could replace components as they wore out, but Schwinn's frames had to live up to the their well-advertised lifetime warranty. Frame strength was a basis of Schwinn's design philosophy. Schwinn did cut a few corners on one of the most time-consuming aspects of fillet-brazing bicycle frames: cleaning up and smoothly finishing the joints. Schwinn's fillets at the head tube are usually well finished, but other joints are sometimes sloppy or not fully smoothened. Schwinn's policy seemed to be to finish the fillets to the extent that they are visible at first glance. 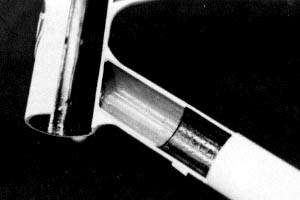 So seatstay-to-seat-tube and rear-dropout brazing was often just partially smoothened, and the undersides of the chainstay-to-bottom-bracket joints were rarely finished or smoothened at all. reinforcing sleeve on a Schwinn fillet-brazed frame. The finished frames were strong, durable, and relatively lightweight. They feature contoured joints, thin seatstays with bullet-point tips, and those slightly oversize seat- and downtubes. Their frame geometry includes long chainstays and fork rake, a low bottom bracket shell, a 73 degree seat-tube angle, and a 72 degree head-tube angle, all of which provide a smooth and stable, "sweet handling" ride. With these models Schwinn achieved a nice balance of frame rigidity and smooth handling. Although they were fabricated in the same shop as the Paramounts, from there Schwinn's fillet-brazed frames took a different production path. Paramounts continued through their own paint and assembly processes, while the fillet-brazed models were added to the assembly line with high-volume Schwinn flash-welded frames for serial-number stamping, electrostatic painting, and final assembly. Hence Paramount serial numbers are unique to Paramounts and serve as a tally of Paramount production, while serial numbers on the fillet-brazed models were mixed in with other Schwinn models. This is also why the fillet-brazed models came in the same colors as lower-priced Schwinns, which contributed to their obscurity. Before 1965 serial numbers were stamped onto a rear dropout. Beginning in 1965 serial numbers were moved to the head tube and the following date system was used for all Schwinns except Paramounts. The letter at the beginning of the serial number indicates the month of manufacture, skipping the letter "I." For example, "A" = January, "B" = February, and "J" = September. The second letter of the serial number indicates the year of manufacture (not the model year), beginning with "A" = 1965. Skip the letter I & O. Sports Tourer KH017873, for example, was built in October 1972. For more on Schwinn serial numbers, check out the Waterford site. These heavy steel Schwinn components didn't really match the quality of the fillet-brazed frames. European and Japanese alloy components had become customer benchmarks for fine bicycles, and the quality of the Sports Tourer and Superior, in particular, was obscured by the use of these steel components. Perhaps Schwinn selected these components out of habit, or maybe to offset the higher cost of fillet brazing. But fillet brazed sales undoubtedly stayed low as a result. Perhaps production capacity in the handbuild shop was too limited for Schwinn to make a high-volume product there? Around the 1971 model year, the Super Sport began to look even more like the flash-welded Continental below it in the Schwinn lineup. Its chrome-plated fork was changed to painted, hubs went to the cheaper "Atom" version (triangular cutouts instead of oval), and its rear dropouts went from forged Hurét with an integral derailleur hanger to stamped steel without a hanger. Customers probably saw this Super Sport as a slightly upscale Continental, differentiated primarily by CrMo frame tubing, alloy rims, and a leather saddle. Few realized the Super Sport's frame, unlike the Continental, was actually fillet-brazed. The most desirable fillet-brazed models in the 1962-78 series are probably be the 1971-1975 Sports Tourer and 1976-1978 Superior. Their frames are CrMo throughout with forged rear dropouts and a threaded bottom bracket for cotterless cranksets, and they have a chrome plated CrMo fork. On bikes with original paint the model decal, "CrMo" decal on the seat tube, bullet-pointed seatstay tops, and round "Schwinn-Chicago" badge on the head tube will indicate one of Schwinn's fillet-brazed 10-speed bicycles. Oversize seat- and downtubes are another clue. If these tubes are less than 1 1/8 inch in diameter, it is not a fillet-brazed model. The seatpost should be near 27 mm in diameter. If you find a welding seam inside the seat tube it is not a fillet-brazed model. Alloy rims, double-butted spokes, leather Brooks saddles, and lighter weight also differentiate the fillet-brazed models from the higher volume, flash-welded Schwinns. The 1962-63 Superior has a one-piece steel (Ashtabula) Hurét crankset with 3 chainrings (15 speed). The 1962 model has 26-inch wheels and the 1963 model has 27-inch wheels. Several factors led to the end of Schwinn's fillet-brazed line. By the mid 1970's Schwinn's Super Sport and Sports Tourer/Superior weighed a few pounds more than comparably priced bicycles at a time when light weight was increasingly important to customers of quality bicycles. Fillet-brazed frames are also more costly to produce than lugged frames because they are made by hand and require hand finishing. Many other types of bicycle frames, including lugged, can be made on automated machines. But three significant factors collaborated in a way that the inherent quality of the Super Sport and Sports Tourer/Superior could not overcome: 1) Fillet-brazing was virtually unknown as a method of building superior-quality bicycle frames, 2) The Super Sport and Sports Tourer/Superior looked too much like the cruder and heavier flash-welded Continental and Varsity, and 3) Schwinn did little to show customers the difference. During the bicycle boom of the 1970's customers learned to equate lugged frame construction with higher quality. Richard's Bicycle Book of 1972, a popular title of the day, states emphatically that, "In better bikes the frame is lugged and brazed..." and does not mention any other quality framebuilding method. Customers preferred lugged construction and equated lugless frames with Varsitys and Continentals or, worse, low-quality department-store bicycles. Schwinn's flash-welded Continental and Varsity were selling well, but for the growing body of lightweight bicycle buyers they were in a lower class. When you look at the head-tube and seat-clamp areas of the Super Sport and Sports Tourer/Superior - some of the most noticeable spots on a bicycle - you'll find they look nearly the same as on a Continental or Varsity! Even the paint colors were the same (remember that the fillet-brazed frames were hung on the general Schwinn painting line). Only the round Schwinn badge, downtube diameter and pointed seatstay tops are visibly different. Customers also equated Schwinn's chrome-plated steel components with the Continental and Varsity. In customers' eyes the Schwinn headset, stem-shifter, pie-plate spoke protector and brazed-on Schwinn kickstand ( "welded-on" in the customer's mind), probably did more than anything to shove the Super Sport and Sports Tourer into the Varsity class. The kickstand, spoke protector, and stem shifters were finally deleted from the last (1976-1978) fillet-brazed Superior, but it was too little, too late. Interestingly, Schwinn's 1970's catalogs didn't really differentiate the fillet-brazed CrMo models either. They were simply shown on the next catalog page, right before the Continental page. No separate catalog or distinct section for "lightweight touring and racing bicycles," and no detailed discussion of the benefits of seamless CrMo tubing and fillet brazing. Schwinn's catalog copy for the last fillet-brazed Superior (1976-78) did begin to mention "hand made" and a little more on fillet brazing. Again, perhaps Schwinn didn't highlight the fillet brazed models for fear of overloading its handbuild capacity. So here's the end of the story. In 1978 production of the fillet-brazed Superior stopped, which marked the end of production for a fine Schwinn frameset whose basic design had been in service since 1938. Forty-one years. Today fillet brazing is a fabrication method best suited for custom and specialty bicycles, yet from 1938 to 1978 you could walk into any Schwinn shop and buy this kind of bike off the rack. Unless we invent a fillet-brazing machine, it may never happen again. I appreciate your interest in this special line of Schwinn bicycles, and hope your heart takes a little jump if you see one of the fillet-brazed models out there. Perhaps spotting a "Chrome Molybdenum" decal on a Schwinn seat tube will make you think of the handbuild area of the now gone Chicago factory, where Schwinn's framebuilders built Paramount, New World, Super Sport, Sports Tourer and Superior framesets for many years. Schwinn bicycle names such as "Super Sport" and "Superior" have been re-used for different models over the years, in part to hold on to copyrighted names by periodically re-using them. This may explain why the Sports Tourer was renamed the Superior in 1976. After Schwinn's fillet-brazed line came to an end in 1978, the "Superior" name went on to be used for the so-called "baby Paramount." That Superior was a Paramount frameset (lugged) with Campagnolo's lower-level Gran Sport component group and a bright orange paint job. Schwinn's Chicago handbuild shop was closed in 1979 and production of the Paramount came to a halt at that time. Paramount production resumed in Waterford, Wisconsin in 1981. In 1979 Schwinn offered one last fillet-brazed CrMo bicycle: The "Sport Limited." The Sport Limited was sold to use up a supply of Super Sport frames that Schwinn still had in inventory. It was available only in a Scarlet Red color, in both women's and men's frame designs. About 1000 Sport Limited's were made and sold to Schwinn dealers for resale as they saw fit. A factory-suggested retail price was not given, and the Sport Limited did not appear in any catalog. The Sport Limited used wheels and other parts from the fillet-brazed Superior. An interesting feature of the Sport Limited was that although the frame had an Ashtabula bottom-bracket shell for one-piece cranks (like the Super Sport), a conversion bottom-bracket spindle was used to fit a "Schwinn Approved LeTour" aluminum-alloy cotterless crankset. The technology of Schwinn's fillet brazed models has been eclipsed by today's bicycle frame, shifting, and braking technology. And the strategy of fillet brazing has been eclipsed too. But it is worth remembering this peculiar little chapter in the story of Chicago Schwinns. Information for this article came from interviews with members of the Schwinn Bicycle Company (conducted in 1989), Schwinn Consumer Relations, the Schwinn History Center in Chicago, several Schwinn Bicycle Shops, Schwinn catalogs, and Mr. Robert Evans. Special thanks to Mr. Jim Hurd.